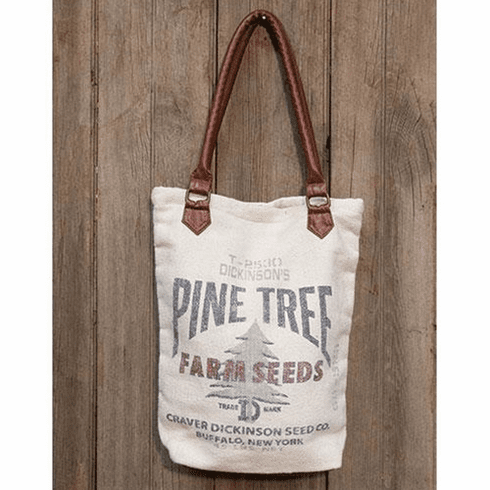 Pine Tree Feed Sack Tote is a canvas fabric tote bag with a feed sack style design. Bag features the image of a pine tree surrounded by the words, "Pine Tree Farm Seeds. Craver Dickinson Seed Co. Buffalo, New York. 45 LBS. NET." Interior of the bag is lined with a cream fabric that has blue compass illustrations. Tote includes two leather shoulder straps, a leather enforced base, a magnetic closure button, and one interior pocket. Measures 16" high by 14" wide and 5" deep.